In this sequel to Frank Miller's seminal graphic novel Batman: The Dark Knight Returns, it's three years later and the DC Universe is at peace. At least on the surface. And Batman must return once again to save the world from themselves. Still, the world looks fine: a perfectly choreographed, pretty little world where everything that's ugly, or even potentially disturbing, is all nicely wrapped up with neat little ribbons and swept under the carpet. Only Batman knows better. He's watched it fester to near-breaking point, and it's time for the only free man left who can effect any real change to bring it all down around their ears once and for all. The Dark Knight returns once again with a vitality unseen since the first years of his war on crime. Together with his army of Bat-soldiers, including Carrie Kelley—formerly Robin, and now the new Catgirl—the Dark Knight wages a new war on a diseased world that's become completely lost. 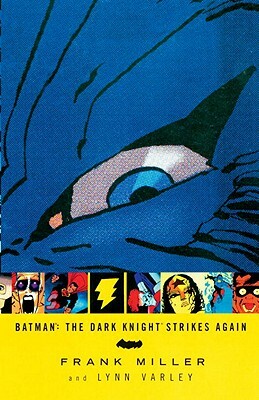 Batman: The Dark Knight Strikes Again features appearances by such DC icons as Superman, Wonder Woman, Green Arrow, Martian Manhunter, the Atom, the Question and more. But are they still the World's Greatest Heroes or part of the conspiracy? This incredible volume, designed by multiple award-winner Chipp Kidd, features a new introduction by Miller commenting on returning to the world he created fifteen years ago. The book includes the complete 3-part story, plus numerous sketches and other never-before-seen material. Frank Miller began his career in comics in the late 1970s and rose to fame while first drawing, and then writing, Daredevil for Marvel Comics. He was also the creative force behind Batman: The Dark Knight Returns, Batman: Year One, and Batman: The Dark Knight Strikes Again. His many works have not only redefined classic characters, but also, on a few occasions, revitalized the comics industry. His creator-owned Sin City hit the page in 1991, and then the silver screen in 2005 — with Miller on board as co-director. His multi-award-winning 300 graphic novel was brought to full-blooded life in the 2007 motion picture of the same name, and in 2008 he directed the feature film of Will Eisner’s The Spirit.